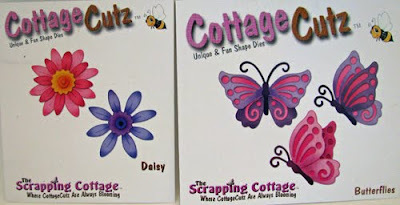 I have the hardest time each month deciding which of the fabulous new Cottage Cutz I want to order!! And I know I am not alone in my dilemma!! These Seed Packet Shapes from the April Garden Release are sooooooo cute and naturally I wanted them all, but I decided to go with some I thought could work "double-duty". You know me...I am all about getting the most from my dies. 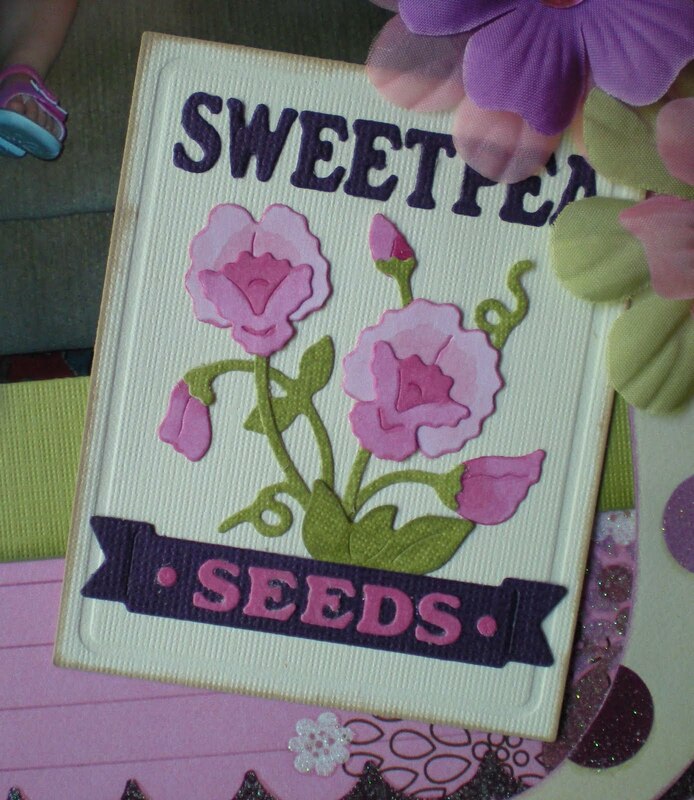 I chose to get this Sweet Pea Seeds Shape because I thought I could incorporate it onto pages of my little Sweet Peas. I knew I definitely wanted the Seed Packet Frame to go along with it because it is perfectly designed to coordinate with the different Seed Packet Shapes available in this release. I cut the stems out of the same green cardstock I was already using in the layout, but I lightly stamped over it with my Cat's Eye Chalk ink to give it more of a mottled look. I also used my Copic Markers to color in the different Sweet Pea flowers and petals. This is another shape that went together surprisingly easily considering all of the detail that you see. The stems are just two pieces, and then the leaves at the bottom just sit right on top of the stems. Once you have the two stems glued together, it is easy to place each of the Sweet Pea flowers right where you want them. Thanks for stopping by today and I hope everyone has a fun and crafty weekend!! Tell us how you are going to be spending National Scrapbook Day tomorrow!! With Spring here and Summer fast approaching, I wanted to make some creations for my garden. These are the CottageCutz dies I am showcasing today. I purchased the wooden sign from Hobby Lobby, it was painted red. I painted it black and then sanded it to let some of the red paint show through. I used mod podged to adhere my CottageCutz die cuts and letters onto the wooden sign. After they had dried completely, I went back over them with a couple more coats of mod podge to keep the die cuts secure and protected. 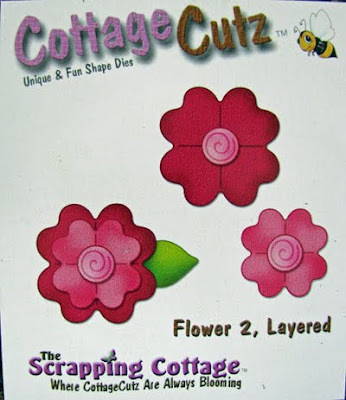 With the NEW CottageCutz Garden release coming next month, look for more garden projects ideas in future posts. into something fun and usable. I really like using clothes pins to create simple projects. I am going to show you how to make some refrigerator magnets. The CottageCutz dies are the perfect size for attaching to the top of the clothes pins to customize the magnets. With all the choices in CottageCutz dies you could make magnets for every season and holiday. This would also be a great project to do this summer with your children or grandchildren. The first thing I did was paint my clothes pins. While the paint was drying I picked my CottageCutz dies, cut and assembled them. I recommend cutting your dies with layers for sturdiness. I cut one layer out of chipboard and then my top layer out of colored cardstock. Once my paint was dry, I attach some magnets to the backside. I like to use magnet tape, you can cut it to size and it has one side with adhesive. I then attached my assembled die cuts to the front. My magnets are now ready for my refrigerator, to hold my son's treasured art projects or my daily lists. I hope you get some creative time today. I'm so excited to show you the new CottageCutz Edger dies. I had a fun package from the Scrapping Cottage waiting for me when I arrived home from work yesterday. I now have my hands on all 9 of the edger dies and look forward to showing you each of them as well as different ways of using them in my upcoming posts. Today we're sticking with the basics. I chose to feature the Flower Edger first. I was so impressed with how well this cut out. The sides just fell off the actual flower piece and the flower centers stay put in case you want to layer (I'll show you that too). I punched out the flower centers for my card below and they popped out really easy. These Edgers are 7" long which makes them great for cards or you can simply cut two of them for layouts. In my fun package I also received dies from the new Garden release. These new flowers are going to be a must have as well. I also used the Flower 2, Layered on my card. I cut the pieces out and then wadded the flowers up before layering. 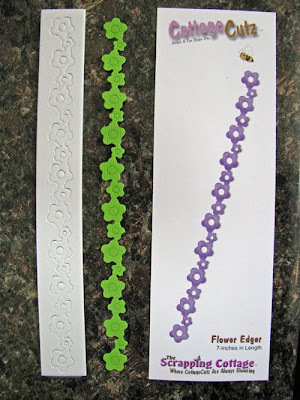 There are so many things to do with these flower dies which I'll be showing you along with the Edger dies. This Saturday I'll show you more edger dies so stay tuned! So what do you think about those NEW CottageCutz Edgers? What are your favorite Edgers? How do you plan to use the Edgers? Which CottageCutz Edgers do you just have to have? Leave a comment telling us what you think about the NEW CottageCutz Edgers and you are entered into the giveaway. That's it. Easy! You have until Friday to post a comment. The winner will be announced next Monday. OK, I know I normally make layouts for my blog posts and leave the card making to Kay, but as soon as I saw this Cottage Cutz Frog Shape, I had so many funny ideas for cards, I just couldn't wait to get my hands on it so I could start making some!! This is my first froggy card and I wanted to make a Get Well card. I thought the Kermit the Frog saying was so funny to put onto a get well card! On the inside of the card, I have written get well soon and of course there is plenty of room to add a hand written note. I used some bright papers from American Crafts because after all, this card is supposed to make someone feel better and what better way to lift a friend's spirits than starting off with some fun colors and patterns! Not that I am hoping any of my friends get sick, but I really can't wait to send this card to someone!! I think this card would also work well for someone experiencing morning sickness (lots of "green" time there!) as well as a friend just having a hard day. 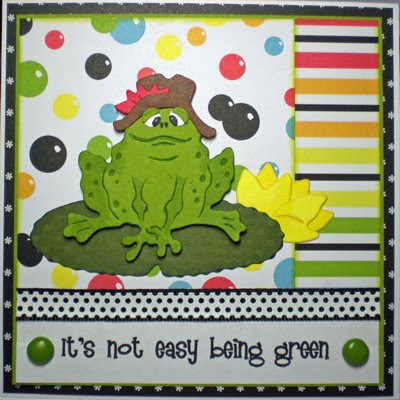 For something totally different, you could also make a "Going Green" Earth Day card using this same frog. I would love to hear some other ideas for this funny little frog!! Be sure to check in this weekend for a special announcement!!! Have a great day!! I am "in love" with the CottageCutz Mini dies. They are so easy to use and so easy on the wallet. If you haven't tried CottageCutz dies, I suggest starting with the Mini's. You will be hooked! 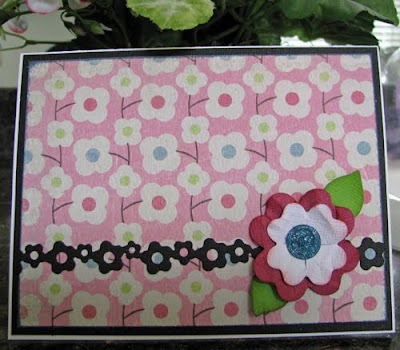 For my layout, I used the CottageCutz Mini Picket Fence die to make a border across my page. I added one more CC Picket Fence cut up near my title to keep things balanced. I wanted the layout to keep with the whimsical feel of the background paper, so I added clusters of the CottageCutz Daisy flowers around my photo. The CC Daisy can be cut either single or double. For the final touch, one CottageCutz Mini Snail tucked into the flowers. Have a favorite? Have a question? Let me know - we love to hear comments from our followers! Butterflies! One of springs wonders and so popular right now in paper crafting. 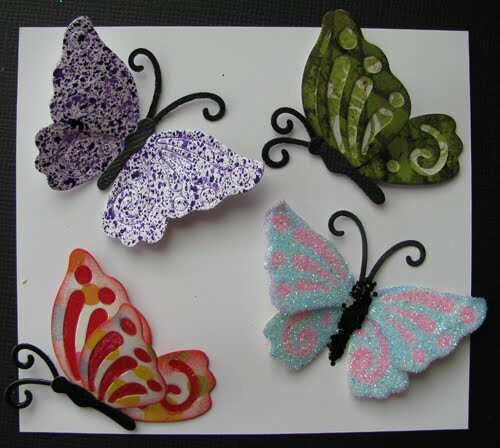 I decided to start making up butterflies with all kinds of colors, textures and embellishments. 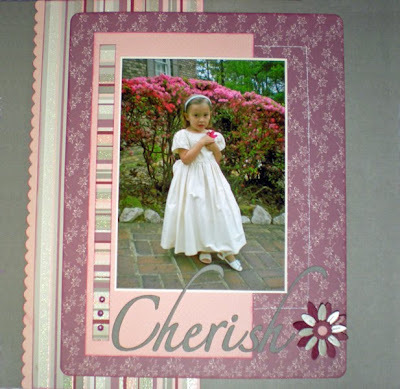 I used Pearl lustre cardstock, Diamond Stickles and Kaiser pearls for this beauty. 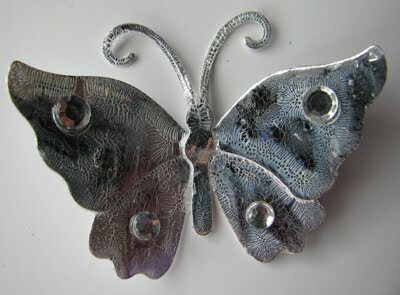 I used silver metallic cardstock, Silver Stickles and gems from Hero Arts on this one. Glossy Accents adds texture and shine. 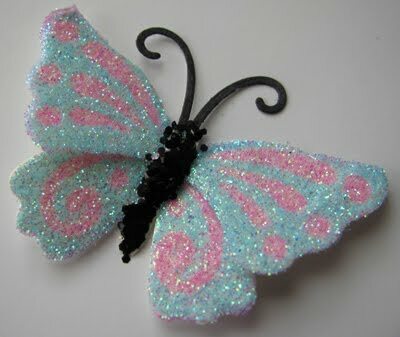 Doodlebug fine and chunky glitters for this one. I used Distress Crackle Paint in Rock Candy for this cool effect and some Kaiser gems. The ideas are truly endless! 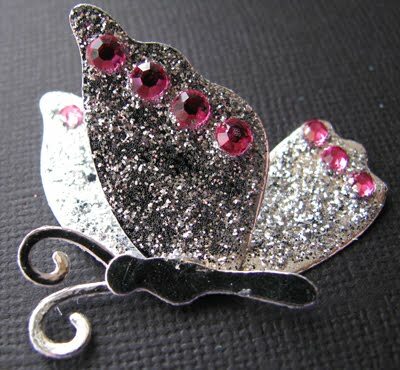 Why spend all the money buying pre-made embellishments when you can make your own. 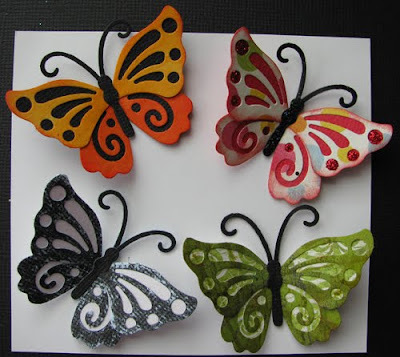 If I haven't convinced you to buy the CottageCutz butterflies than I don't know what will! Glossy Accents, Distress Crackle Paint, Distress Ink, Gems, Pearls, Stickles, Glitter, Smooch Spritz, Copics, metallic cardstock, Coordinations cardstock (sanded), all patterned paper, all cardstock, all solid, all one color, two tone, airy (without the background and pieces punched out), top layer only, background solid only, pearl lustre cardstock, solid w/patterned paper, Swiss dots cardstock. As we showcase the different CottageCutz dies we hope you will love them so much that you will want to buy them too. Well, it works on the Design Team too. Ruth Ellen used this die back in February and when I saw it I knew I had to have it too. 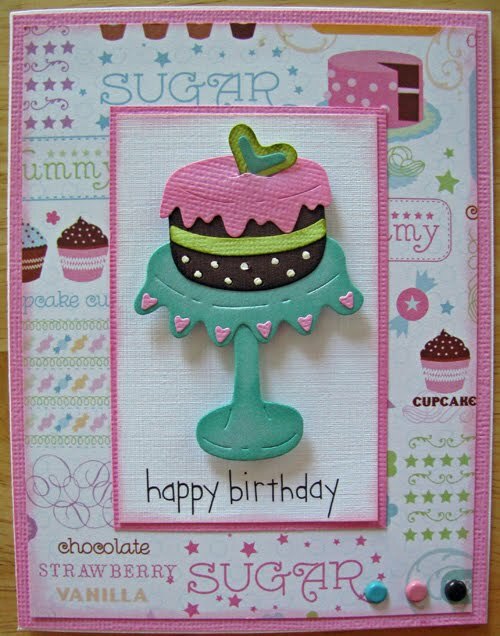 This paper from DCWV goes perfect with this Cake w/Pedestal die which is also on sale right now for $11.95. There are lots of really cute patterned papers out there that go so well with the CottageCutz dies. We'll see ya back here tomorrow for Watch for it Wednesday! Remember to leave your comments. We've chosen 3 winners for leaving comments this past week. They are Dragonlady, Carol and craft_princess! Thanks so much for taking the time to leave us comments, we like to hear from you our followers on what you like to see and how we're doing. 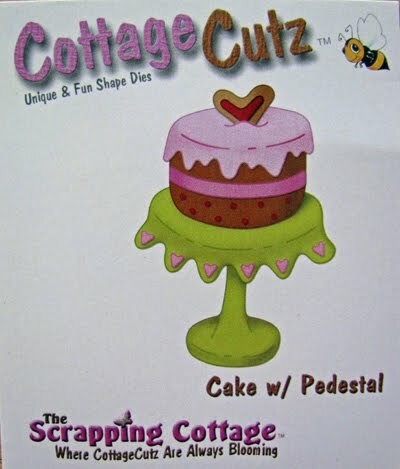 Just email your choice of any in stock Mini Cottage Cutz die to scrappingcottage@cox.net along with your name and address as well as your blog name. CONGRATULATIONS! Now that was easy wasn't it?? For this ladybug, I simply cut out the different body parts from different colors of cardstock. There are only two leg pieces to attach (not six different legs!!) so really, this die goes together pretty quickly considering how much detail you see. I used my tip from this week's Watch for it Wednesday post to put the black spots onto the ladybug's back. So much easier than trying to put adhesive on the back of each of these smaller pieces! Thanks for coming by and have a great weekend!! 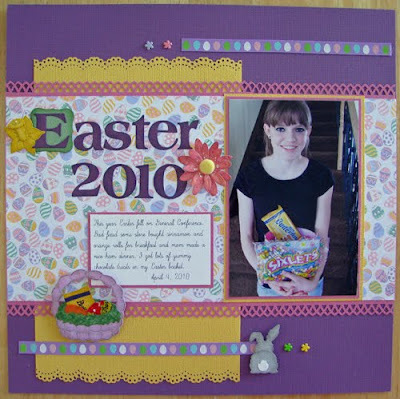 The CottageCutz Easter Build a Basket die really is a basket full of possibilities! The die has so many cutting options that it can be made to fit any Easter layout or project. This is the CottageCutz die I am showcasing today. For my layout, I chose to use the eggs plain, I used the grass instead of the doily and finally I used just the bow without the ribbon. I also cut two additional bows to use as accents around my page. The possibilities are endless with this die. It was the perfect die to incorporate into the long title/quote on my page. Today's tip is designed to help when you are piecing together some of the smaller more detailed pieces on your Cottage Cutz dies. One of my favorite things about the Cottage Cutz shapes is the phenomenal details found in these dies. I feel like this attention to design is one of the biggest things that sets the Cottage Cutz dies apart from all other metal dies on the market today. Now, that being said, sometimes the intricacies of some of the shapes may be intimidating when you first sit down to begin piecing the smaller accent pieces onto your shape. My tip for today is a technique I have started using that saves me time and headaches! 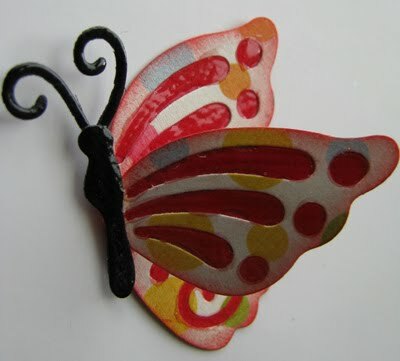 Let's take for instance the adorable new Ladybug Cottage Cutz shape from the Spring Release. This die really pieces together pretty easily and quickly. However, you do have the small block spots to contend with before your die cut is complete. Rather than try to apply adhesive to the backs of some of these smaller pieces, instead place small dots of adhesive where you want your spots to be placed onto the larger shape. So you simply need to pick up your glue of choice (I like Zip Dry) and then dot several little dots of glue right where you plan to place the spots. Once you are finished applying glue, just pick up your sticky stick (or whatever you like to use to pick up your smaller pieces of paper) and quickly and easily, place the black spots right onto the dots of glue. Using this method cuts down the time and energy that would otherwise be spent painstakingly applying adhesive to the backs of each tiny little black spot one at a time and then placing the spots down onto the shape. I hope this little tip has given you some motivation to get out some of your dies that maybe you haven't tried yet and see what you can come up with yourself!! Have a great day and be sure to come back tomorrow for another fabulous creation from the very talented Karen!!! 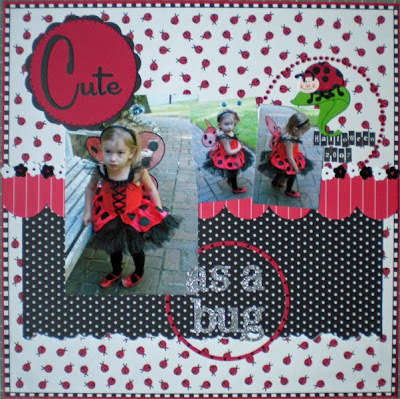 And then on Friday, I'll post my layout using an adorable little Ladybug I created using today's tip! If you've been following this blog regularly you'll know that I post cards I've made with the CottageCutz dies. Since Easter is over and I wasn't through showing you my wonderful Easter dies I thought I'd do a layout this week. This CottageCutz Build a Basket die is so versatile and goes together quickly. I simply matched the color cardstock to my daughter's Easter basket, added some grass and a couple of eggs. I took one of the eggs and covered it with a wrapper from a mini Cadbury egg since you can see a bit of one peeking out of her basket. I also made my own Butterfinger candy bar to tuck inside. This die comes with grass, eggs, a bow, chicks and a doily like cloth so you can customize your basket for whatever you like. I also used the Mini Daffodil, Daisy and Mini bunny on my layout. We want to hear from you our blog followers. Do you like the project? Do you have this die? Do you have an opinion on what you'd like to see on the CottageBlog? Give us some feedback and leave a genuine comment on the posts this week and we'll reward a few random lucky posters with a Mini CottageCutz die. My post for today features a layout using the new Cottage Cutz Daisy Shape. This shape is a great little 3x3 die with so many possible combinations making it about 3 or 4 shapes for the price of one. Now that is my kind of die! Just think of all the different ways you can personalize these flowers with different papers, textures, materials, etc. For my layout, I wanted to use the Daisy Flower shape to create a perfectly coordinated accent. I love being able to match the colors in my patterned papers as closely as possible when choosing my embellishments. 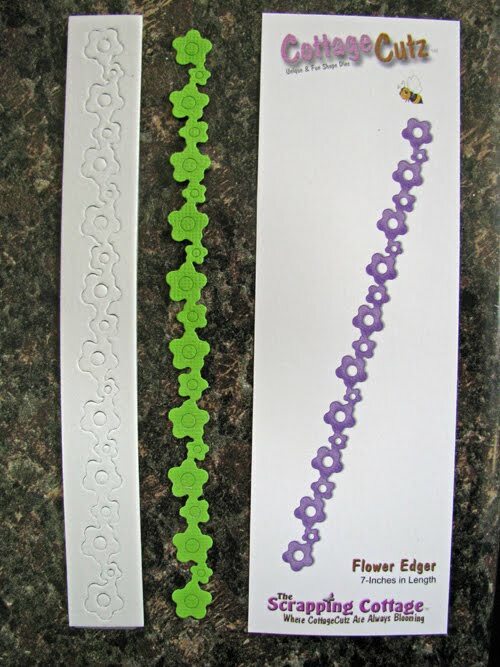 For this reason, the Daisy shape was a must have for me because now I can use it to create great looking multi-layered flowers that coordinate perfectly no matter what papers I am using on my projects! 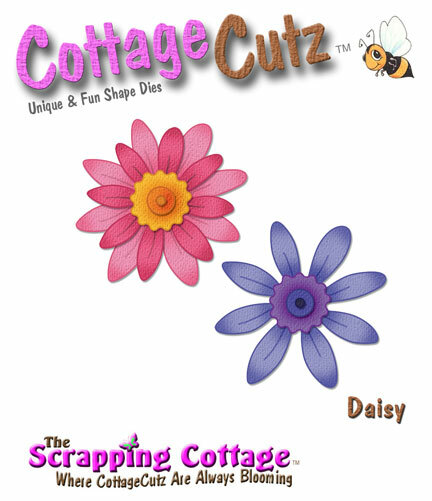 The Cottage Cutz Daisy Shape is a simple die to piece together and it would be easy to make yourself a whole little garden of these pretty little Daisy's to keep on hand when you need an accent. Thanks for stopping by today and I hope you have a great weekend!! The CottageCutz Mini Chocolate Bunny is pure goodness! No calories...No Guilt. 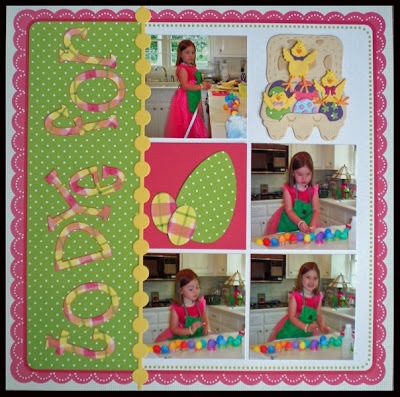 An adorable addition to any Easter layout or project. I added a blue bow to my CottageCutz Mini Chocolate Bunny to go with my "boy" layout. A perfect accent for my Easter photo. How many of you have not-so-good photos to scrap? Maybe blurry or grainy? Too busy or dark? Most of these not-so-good photos are usually from really important events in our lives and need to be scrapped. It can be hard to get motivated or inspired when the photos didn't turn out as we hoped. I wanted to share some tips for scrapping these not-so-good photos. With so many photo editing software programs out there, you can usually fix most photos. Sometimes however, some photos just can't be fixed. Or maybe you don't want to mess with fancy programs. Either way, here are some simple easy tips that have worked for me. My best tip for blurry photos is to incorporate the blurriness into the page. For example, if the photo is from a sporting event or holiday...focus on the speed at which the child played the sport or how fast the holiday went by. By making the blur the focus, it makes the photo fit the page. My best tip for grainy or noisy photos is to use your photo editing software and change them to black & white or sepia. This really helps to take the focus off the graininess and put it back on the subject of the photo. If you print your photos at a Kiosk, most of them have this simple edit available to you. My best tip for busy or cluttered photos is to crop your photo. Using your photo editing software, crop out as much of the extra clutter as you can. Get as close to the person or main focus of your photo when you crop. Kiosks usually have this edit available too. My best tip for over or underexposed photos is to use your photo editing software and change them to black & white or sepia. These two functions seem to even out the exposure. Another option if only part of the photo is overexposed, crop out that area. Again, if you print your photos at a Kiosk, this edit is usually available. My best tip for poorly framed photos is to crop out the dead space, so the focus is back on the main subject, even if the subject is partially cut off. Another option is to use accents, your CottageCutz dies work great. 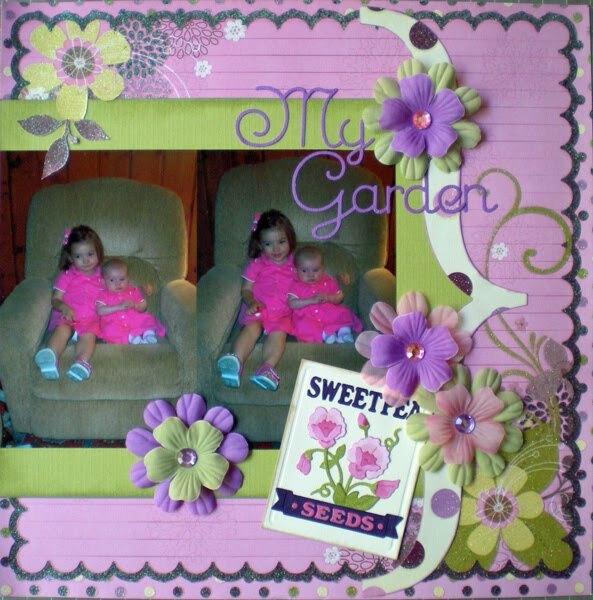 Place the die cuts over the photo in the appropriate place to draw the eye to the die cut instead of the partially cut off subject or item. I hope these tips will help to inspire you to scrap those not-so-good photos. These Spring CottageCutz dies are wonderful for so many occasions. A friend of mine lost her dear father last week and I wanted to make her a special card showing my sympathy. 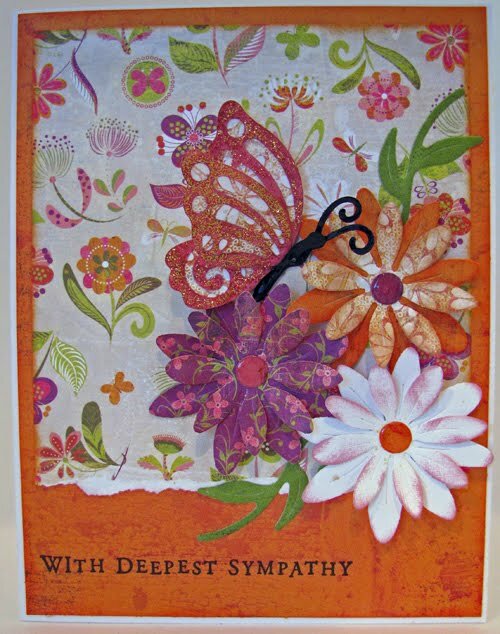 The Daisy and Butterflies dies were perfect to create this sympathy card. As I used this Daisy I was so impressed with how well it was created. It is the closest thing to buying your flowers already made. They can be layered as I've done here or used single with several possibilities for the center. I chose to use the middle sized center and apply a little Glossy Accents. 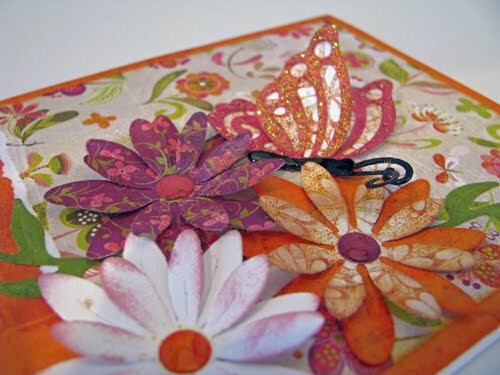 This is one of my top die recommendations because of the versatility and look of these awesome flowers. I made some of these flowers for a layout as well and punched a hole in the center and used velvet brads for the middle. I also used the stem from the Mini Daisy for greenery, I just simply turned the stem the opposite way. There is so little effort to make them pop and give this 3D look. I had to go back and buy the Butterflies Die after seeing Ruth Ellen use them on her layouts. 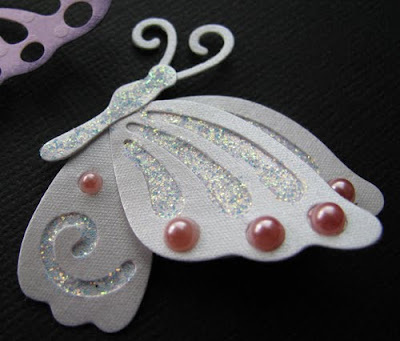 I cut the butterfly that I wanted with my patterned papers facing up to make the butterfly facing the direction I wanted and applied some Stickles to make it sparkly. So whether you're making a spring card or layout, birthday, thank you or sympathy card these dies are perfect for so many occasions. 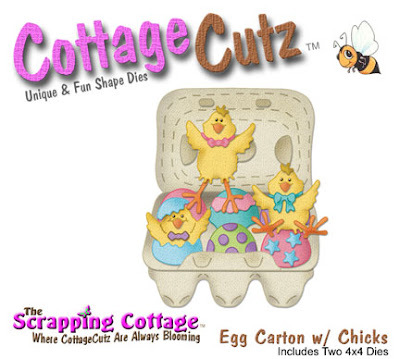 I figure with Easter coming up this weekend, the Cottage Cutz Egg Carton and Chicks is the perfect die to showcase today since many of you will probably be dyeing your Easter Eggs this weekend! This die is part of the Cottage Cutz Easter Release. This shape was so fun to put together because I felt like I was dyeing Easter Eggs but without all the mess! 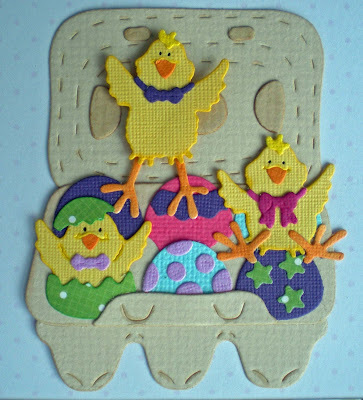 Plus, this shape is a perfect opportunity to use up scraps of paper as you create your different eggs. Every piece of cardstock I used on this layout came from my scrap drawer. Here is a close up shot of this adorable Egg Carton Shape. So many fabulous details on this shape! I used my Copic markers to add some details and shading on the chicks and egg carton. I also used some pop dots behind a couple of the chicks to give a 3-D effect. The March Spring Cottage Cutz release has now started shipping so join us next week as we begin showcasing dies from this release. 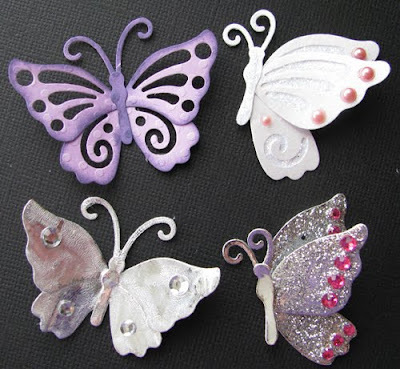 I don't know about you, but I can't wait to see new projects using these Spring dies! Until then, have a Happy Easter!! This adorable CottageCutz Bunny, Girl die is versatile enough to be made a Boy Bunny. Just omit the flower behind the ear, as I have done on my layout. She/He is a cute addition to any layout or project.